Stuff our face with Mexican goodness and guzzle skinny margaritas. Duh. 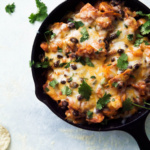 Don’t act like you’re not intrigued with breakfast enchiladas. 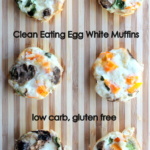 Psssstt… they’re healthy too! The guys who taste tested these for me even approved, buuuuttttt I have a feeling Paula Deen would not. Sorry Paula, we’re saving our calories for margaritas. Let’s be honest with eachother for a moment. There is no pretending that we won’t chase down everything with alcoholic beverages come Saturday. 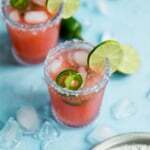 Margaritas with breakfast? Why not? it’s Cinco de Mayo and I love to pretend I’m Mexican! Come on, we know how this holiday works… and how painful Sunday is going to be. Forget about hangovers. Focus on a breakfast that gets you ready for a day full of delicious chips and guac. Since Cinco de Mayo happens to be this Saturday (and because I prefer a week full of celebrations), I thought I’d share this with you a little early. I had been thinking about breakfast enchiladas for quite sometime. More like dreaming about them every night. Anyway I decided to wrap the traditional huevos rancheros breakfast (eggs + beans) into tortillas and load them with delicious business (also known as red sauce and avocados). I’m really happy with that decision because I now want to eat these everyday for the rest of my life. And I can do that because they only have about 230 calories per enchilada. Yes! 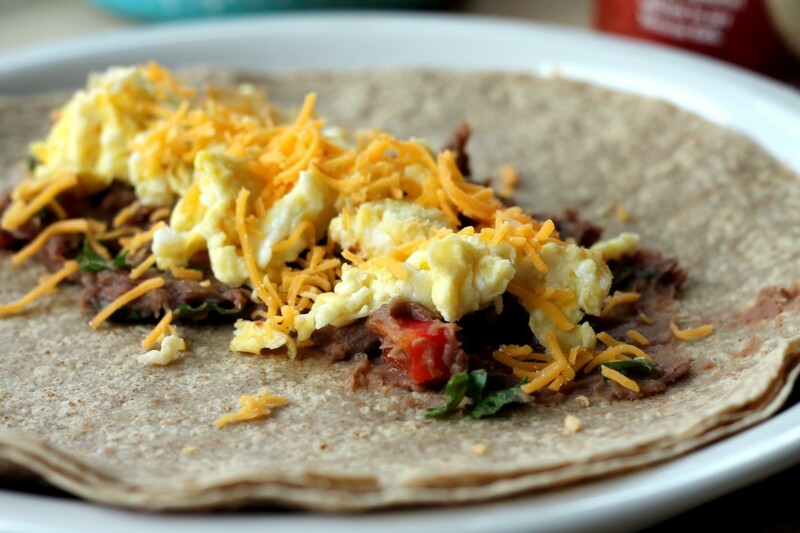 Whole wheat tortillas (because we’re healthy whole grain eating people, duh). Fluffy scrambled eggs (with mostly protein packed egg whites). 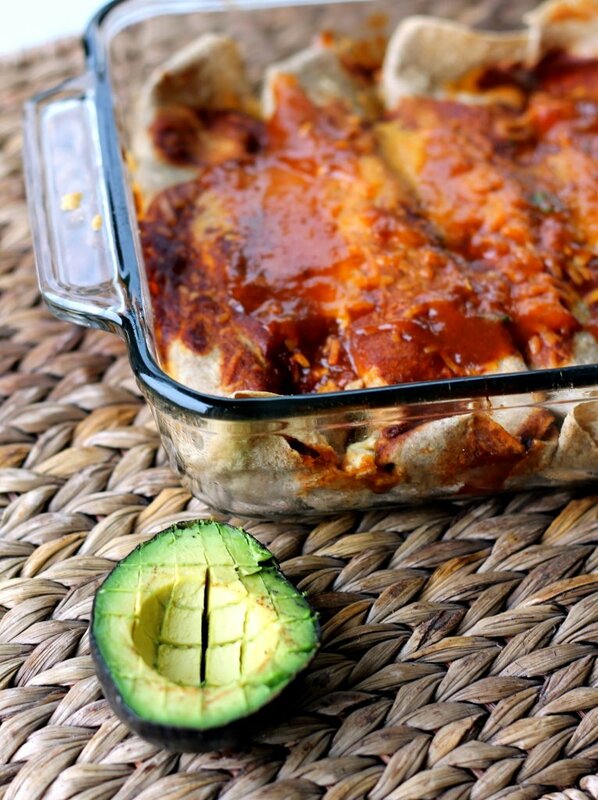 Uhhhh can I just tell you that basically these enchiladas are made from the best stuff on earth? This is the fun part. The delicious business. We combine the things I dream about into the tortillas. 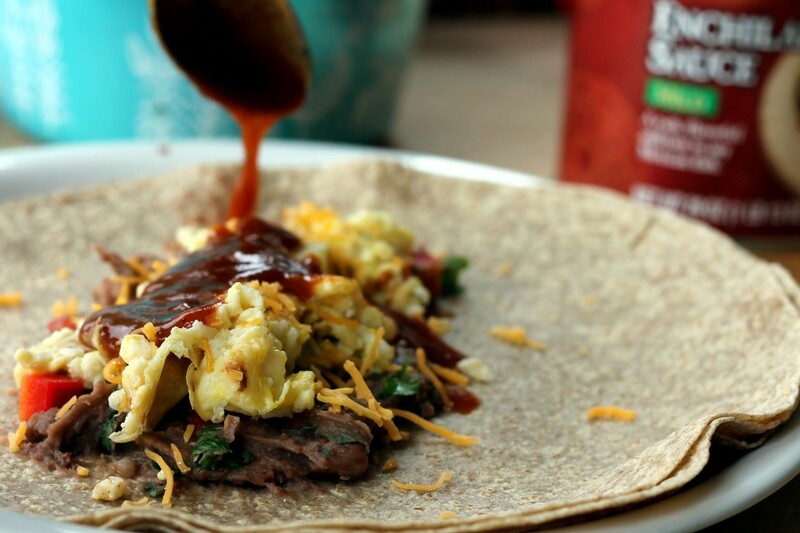 Drizzle with LOTS of red sauce, and roll them up tight. Time to pop in the oven and get ready for a tastebud party in less than 30 minutes. 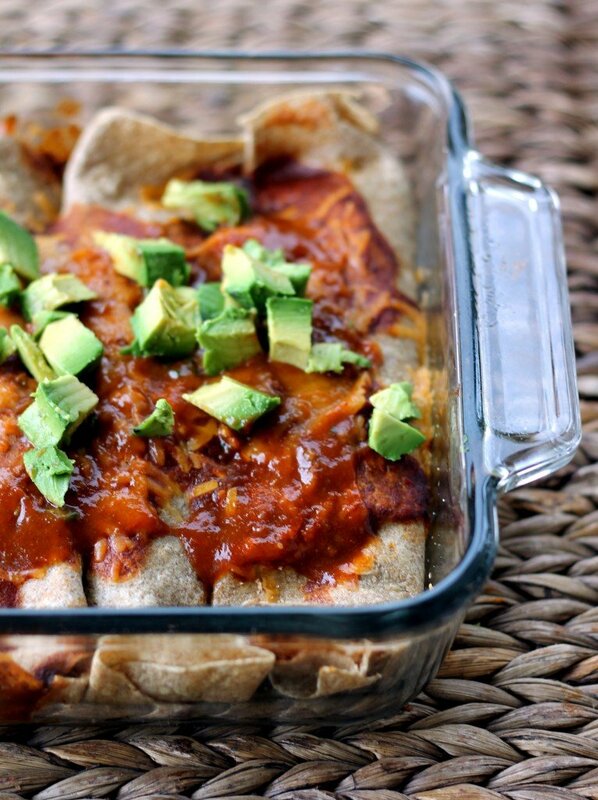 To be honest, enchiladas never disappoint me. And these certainly wont disappoint you. 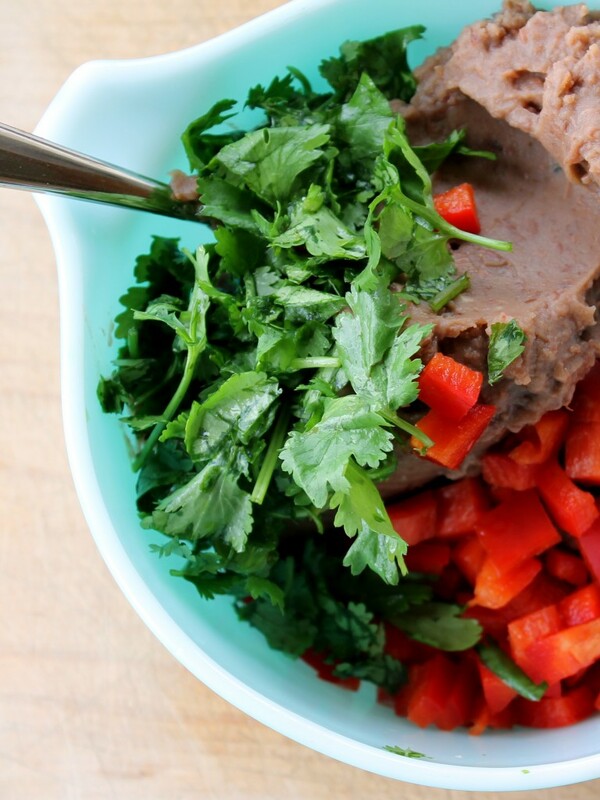 Preheat oven to 350 degrees F. Combine refried beans, diced red peppers, cilantro, and jalapeno together in a large bowl; set aside. In a medium bowl beat your eggs together. Coat large pan with non stick cooking spray and add your eggs. Let eggs set around the edges, and then begin to stir every few seconds, until eggs are barely set and still fluffy. Sprinkle with a dash of salt and pepper. Remove from heat and set aside. Place your tortillas on a microwave safe plate and microwave for about 20 seconds. Next, coat 11×7 inch pan with nonstick spray. 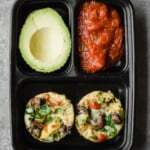 Next fill each tortilla the following way: spread 1/4 cup of black bean mixture in the middle of each tortilla, add 2 heaping tablespoons of scrambled eggs, 1 heaping tablespoon of cheese, and 2 tablespoons of enchilada sauce. Roll each tortilla up one by one and place seam side down in the baking dish. You will end up with 6 tortillas. 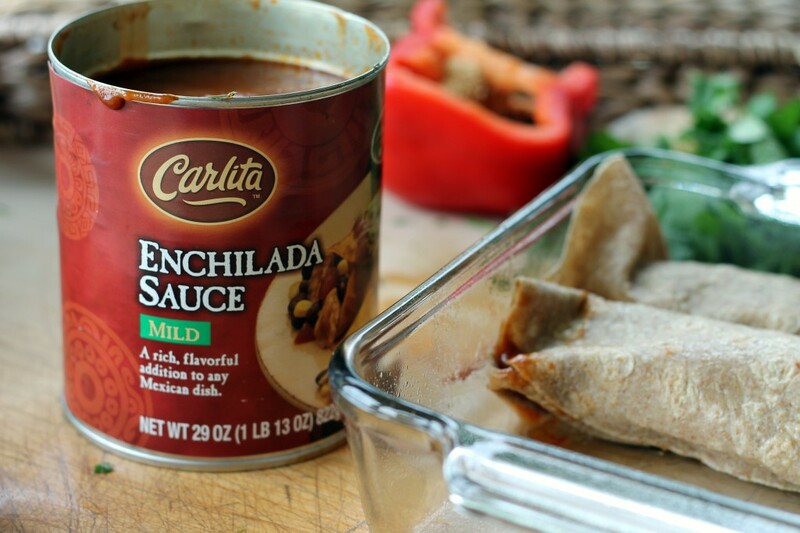 Pour remaining enchilada sauce over the top of the rolled tortillas, then sprinkle remaining cheese on top. Bake 25 minutes. Let stand a couple of minutes, then sprinkle with extra cilantro, tomatoes, and avocados. 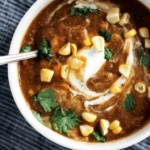 Add 1 tablespoon of sour cream on top if desired. 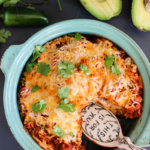 11 Responses to "Skinny Huevos Rancheros Breakfast Enchiladas"
My type of healthy and comforting treat! And I would love LOTS of cilantro! Thanks, they’re so healthy! 🙂 Happy Cinco to you too! 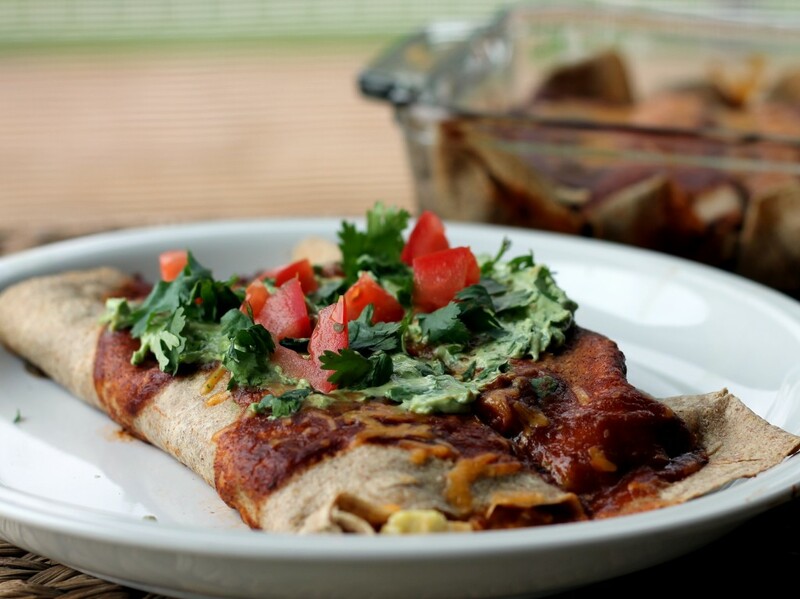 Breakfast enchiladas are just about the best thing I’ve ever heard of. AND they’re healthy?! Thank you, thank you, thank you. Monique! Oh Ma Gawd! 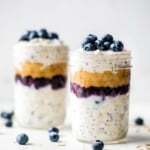 I want these in my belly now! I love enchiladas, but breakfast ones?! wow. Love how wholesome they are too. Hope you had a great Cinco de Mayo. Not gunna lie, I totally chased down my breakfast with a margarita too. Great minds think alike! Cheers to pretending to be Mexican!